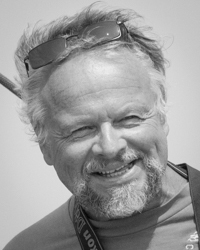 Dr. Bernd Würsig has degrees from Ohio State University (BS, 1971) and Stony Brook University (PhD, 1978); spent 3 years as an NIH/NSF postdoctoral fellow at University of California at Santa Cruz (1978-1981), and 9 years going through the professor ranks at Moss Landing Marine Laboratories (1981-1989). He came to Texas A&M University as professor of marine biology in summer 1989. He is now Regents and University Distinguished Professor (Emeritus since Nov. 2016). He has taught courses in Marine Bird and Mammal Biology, Marine Vertebrates, Bio-Statistics, Behavioral Ecology of Cetaceans, and Study Abroad courses in Mexico, Greece, and New Zealand. Würsig has published 185 peer review papers, chapters, and seven books; and been senior advisor to 70 graduate students and 14 movies on nature interpretation. He was nominated for an Academy Award for an IMAX movie on dolphins. He, his students, and postdocs have studied marine mammal and sea bird foraging, sexual, and social ecology on all continents, with present work on social strategies of dusky dolphins in New Zealand and Indo-Pacific humpback dolphins in Hong Kong. Recent books are “The Encyclopedia of Marine Mammals, Ed. 3” (Senior Editor, 2018), and “Dusky Dolphins; Master Acrobats off Different Shores” (with Melany Würsig, 2010), both Academic/Elsevier.